I have been studying Striated Caracaras, a.k.a. Johnny Rooks, on the Falkland Islands since December 2010. Until my most recent trip I have timed my visits to study the birds either in mid-summer or mid-winter. The plan had been to contrast rook ecology in those two seasons and to draw conclusions regarding seasonal differences in their behavior. The trip I am now returning from has been a “temporal anomaly.” I spent two weeks on the islands in late May, which is “austral autumn’’ (think late November north of the Equator), to learn how the birds make the transition from the summer food largess to the cold and snowy winter lean times. I have known for some time that the bulk of the 150 or so rooks that inhabit Saunders Island in the northwestern part of the archipelago spend most of their summers at and around Gentoo and Rockhopper penguin colonies at the wind-swept “Neck” in the northwestern part of the island (see first photo below) and then move from there to a farm settlement (second photo) at the eastern edge of the island in winter. Penguins and their young provide the rooks with food in summer and the island’s farmer-owner and his family provide most of the food in winter. Ten miles separate the Neck from the Settlement sites and I have seen individually-marked rooks at both locations on the same day, meaning they are able to make the journey between the two sites in a single flight or rapid series of flights. A penguin colony at “The Neck,” a summer hotspot for Johnny Rooks. 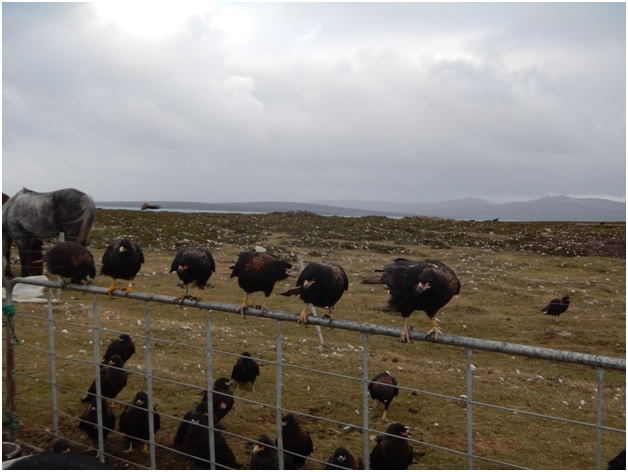 Rooks waiting to feed at the Settlement. The rook on the rail at the far right is a juvenile. When I arrived on Saunders on the 18th of May the overwhelming majority of birds, and almost all of the young birds-of-the-year, still were at the Neck and consuming an unusually large number of dead Gentoo Penguins that had washed up along drift lines surrounding the Gentoo breeding colony. It wasn’t clear what had killed the penguins, but more than 100 rooks were taking advantage of the carcasses nevertheless. And so were several dozen Turkey Vultures. Indeed, there was so much food laying around that the rooks and vultures were feeding relatively amicably without the normal food-fighting that characterizes most of their feeding events. And most of the rooks had clearly bulging crops suggesting that they were “filled to the rim” with penguins. Within a week, however, things began to change. 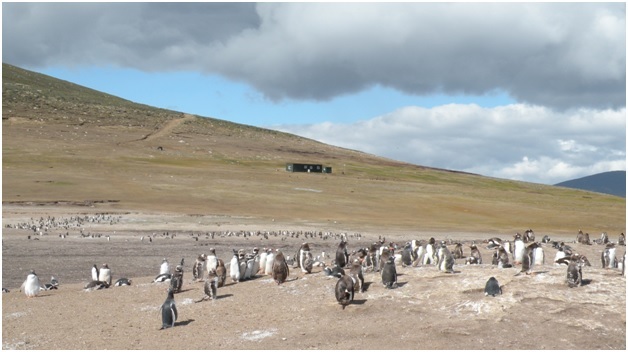 Cold, southerly winds blowing in from Antarctica chilled the island with the first dose of winter weather, the penguin food largess shrank, and the birds began their mini-migration toward the Settlement. They did so in a way that surprised me. Groups of four to 10 rooks–overwhelming young-of the year—took several days to make the 10-mile journey, moving about two to six miles each day and sampling habitats along the way. Relatively little in the way of food exists in the treeless Patagonian steppe between the Neck and the Settlement, and after several days of meandering, the birds arrived. In a manner of speaking, the birds seemingly “settled in” for the winter. By the time I left Saunders Island on May 28, more than 60 of the rooks had made the autumn transition during a period in which temperatures dropped below freezing for the first time since the last austral winter. I had not given it much thought but the onset of cold weather and the lack of available food immediately shifted the birds’ behavior. Until the first freeze, rooks and vultures were feeding together at carcasses. The day after the freeze, gangs of rooks dominated Turkey Vultures at food resources as they normally do in mid-winter. The change literally happened overnight. Unfortunately I was not there to see if the situation reversed itself when warmer temperatures returned the day I left, but the switch was obvious. Anna and I had conducted a survey of rook distribution and abundance in the area immediately surrounding the settlement earlier in the day. As we began the survey on our all-terrain vehicles at the edge of the settlement, a first-year rook flew up and perched several meter away. The bird then proceeded to walk up to a puddle of ice-covered water along the track in front of us and tried to skim a drink from it. As its beak skidded across the ice that glazed the puddle I couldn’t but help imagine what was going through its head. Without parental guidance, the first-year hadn’t a clue how to drink from the ice-covered puddle. The bird flew off several seconds later and I spent the next hour and half on the survey aiming my ATV at the frozen-over puddles that dotted our route. I couldn’t help but break the ice, making the water below potentially available to the young rooks, thinking all the while about what was in store for these youngsters as their first winter approached… a time of the year when as many as a third or more of them would perish. Everyone faces a number of challenges in life, but the longer I study Johnny Rooks the more I appreciate just how lucky we humans are compared with our raucous avian friends. Studying the movement ecology of a vanishing species is quite new to me. Throughout my professional career, which stretches back more than 40 years, almost all of the raptors I have worked with have been relatively widespread and common. And indeed, most have been abundant. Even the endemic striated caracaras, or Johnny Rook, a species that I now study on in the Falkland Islands, are reasonably abundant there. Simply put, none of the species I have spent time studying has been ranked as Globally Endangered by the International Union for the Conservation of Nature (IUCN). None of them, I should say, until I started working with Africa’s hooded vulture in 2013. With a world population estimated at fewer than 200,000 birds and with numbers in many part of its range shrinking as I write this vanishing species clearly is in trouble. Although populations of hooded vultures remain healthy in parts of West Africa, in parts of Central, East, and southern Africa they in rapid decline. As a result, my work with hooded vultures not only focuses on gaining insights into the species’ basic biology and movement ecology, but also on understanding the many factors that threaten its existence in Africa. Like other vultures, “hoodies” feed on dead animals including elephants and rhinos, two species that are themselves declining catastrophically due to poaching. Evidence suggests that 30 to 40,000 elephants are being poached annually. If this keep up, they will be functionally extinct in 20 years. The numbers differ somewhat for rhinos, but the story is the same. Unless things change, they too, will be functionally extinct in two decades. The author near an elephant carcass in South Africa. But what about the vultures? In the short run it would seem that hoodies and other vultures are living in a land of plenty. Lots of dead elephants and rhinos, however unfortunate ecologically, can’t be a bad thing for the scavenging birds of prey, right? But wait a minute…humans are involved in the wildlife slaughter for horns and tusks, and things are not as simple as they appear. Poachers break the law when they shoot wildlife and in many places in Africa, poachers themselves are shot when game protectors attempt to apprehend them. Flocks of vultures circling over freshly poached carcasses often lead game wardens to these criminals while they they can be caught in the act. 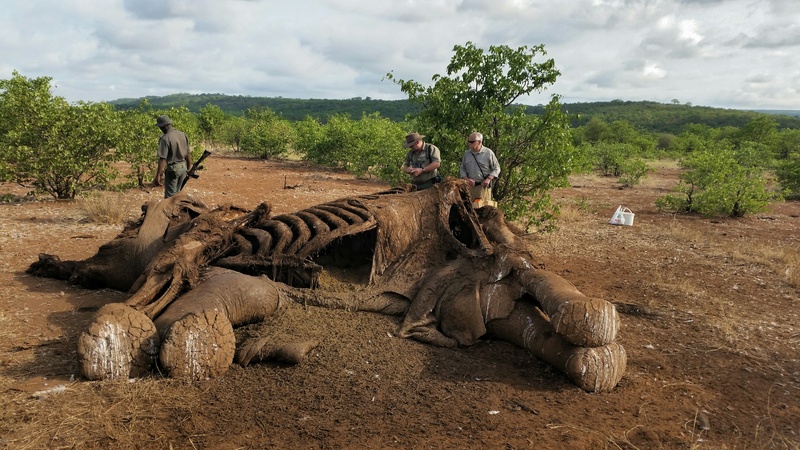 For this reason, the poachers have taken to lacing the elephant and rhino carcasses they poach with poisons to kill carcass-feeding vultures in an attempt to remove them as useful sentinels of poaching activity. Because hundreds of vultures can feed at a single elephant or rhino carcass, lacing several dozen carcasses with poison can remove thousands of vultures from entire landscapes. This is exactly what is happening in parts of Africa. 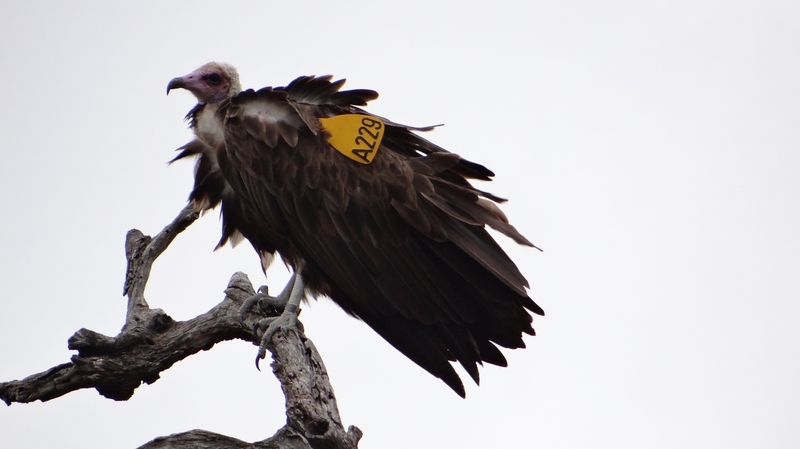 Our work with hooded vultures began in September 2013 when Hawk Mountain Research Associates Drs. Corinne Kendall, Marc Bechard and I, working together with local Gambian conservationists, placed satellite tracking devices on four hoodies in The Gambia, a stronghold for the species in equatorial West Africa. Since then, colleagues have placed additional units on four individuals in Ethiopia, an East African stronghold, and on eight individuals in and near Kruger National Park in northeastern South Africa, a region with far fewer hoodies than The Gambia and Ethiopia. One of our South African hoodies, a juvenile named Ngotso that was tagged in August 2014, has a club-shaped home range that stretches for just over 400 kms (250 miles) from northeastern South Africa into southern Zimbabwe. It turns out that Ngotso is, quite literally, living on the “front line” of vulture conservation in the region. 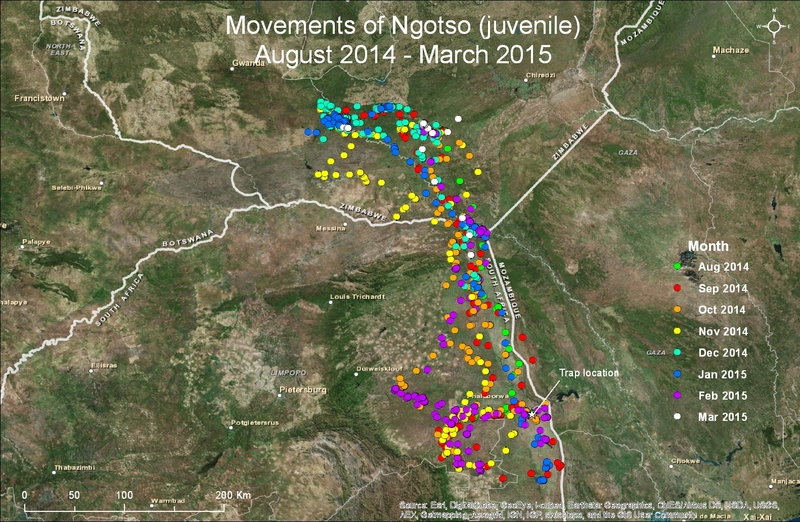 Its movements, which we have now tracked for 10 months, clearly illustrate its use of areas within Kruger National Park and several protected areas in southern Zimbabwe (see movement map below), as well as its avoidance of areas in bordering Mozambique, where poaching has eliminated most of the large game regionally. He has even been re-spotted in the field a few times (see photo below courtesy of Andre Botha). Unfortunately, poachers from Mozambique recently have moved into Kruger and are now poaching there as well. In fact, one of the trap sites we used in December 2014 was the carcass of a poached elephant well inside the National Park. Preliminary results from our Pan-African studies suggest that densities of hooded vultures are more than 500 times greater in The Gambia than in Kruger National Park and that their home ranges are more than four times larger in Kruger than in The Gambia. Part of this geographic difference in abundance clearly results from the fact that Kruger supports higher densities of larger and competitively superior species of vultures that out compete the smaller hoodies at carcasses. A significant part of the difference, however, is due to human activities. In The Gambia, the hoodies live in harmony with people, both in natural and in human-dominated landscapes. Whereas in South Africa, the species usually is not tolerated by people and is now restricted to ranging in large protected areas. The larger home ranges in South Africa are particularly unfortunate as expansive foraging areas substantially increases the risk. A single poaching event coupled with poisoning of the resulting carcass can kill a large proportion of a regional population of hooded vultures. Our preliminary results, which we recently shared with African conservationists in the field, should help colleagues there better protect this this critically important avian scavenger. The plan is to expand our studies of hoodie movement and home-range ecology in other parts of Africa including Zimbabwe, Tanzania, and Uganda, and to extend our use of camera traps at nest sites to better assess their breeding success both within and outside of protected areas. We believe that the information we are now gathering and sharing with colleagues will help us and them to better protect this species. That said, expanding our efforts is essential. All of this costs money…actually, a lot of money. Camera traps cost several hundred dollar each and satellite tracking devices cost $4,000 each to buy and an additional $600 per device per year to download the data they collect. And then there are travel costs associated with fieldwork. So far the project has cost close to $100,000. We estimate that expanding and completing our work will cost an additional $150,000. If you or someone you know has the capacity to help us in this effort, please contact me via email bildstein@hawkmountain.org, by phone at 1-570-943-3411 ext. 108, or via regular mail at Keith L. Bildstein, Hawk Mountain Sanctuary, Acopian Center, 410 Summer Valley Road, Orwigsburg, PA 17961.